I chose the battle of Villers as the setting for the war action of Soldier Dog, for several reasons. Firstly because the importance of the work the dogs did on this particular front. The conditions underfoot at this stage of the war were so appalling, the land so ravaged and water-logged, that it was almost impassable for man or horse or machine. I chose the battle of Villers as the setting for the war action of Soldier Dog, for several reasons. Firstly because the importance of the work the dogs did on this particular front. The conditions underfoot at this stage of the war were so appalling, the land so ravaged and water-logged, that it was almost impassable for man or horse or machine. Human runners, sent out to deliver messages from the back to the front lines, could drown in the thick, hungry mud of the shell holes. In addition, the slope at Villers, leading up to the British positions, meant that the runners were exposed and vulnerable and deaths amongst them were very high. The heavy German shelling of our telegraph and telephone wires made communication at many times impossible. Visual signalling, by semaphore or heliograph or Aldis lamp was frequently not possible because of heavy fog. Pigeons were of limited use during this battle because they dislike rain and fog. So there were times at Villers when the only way of getting a message from the front to the back lines was with a dog. 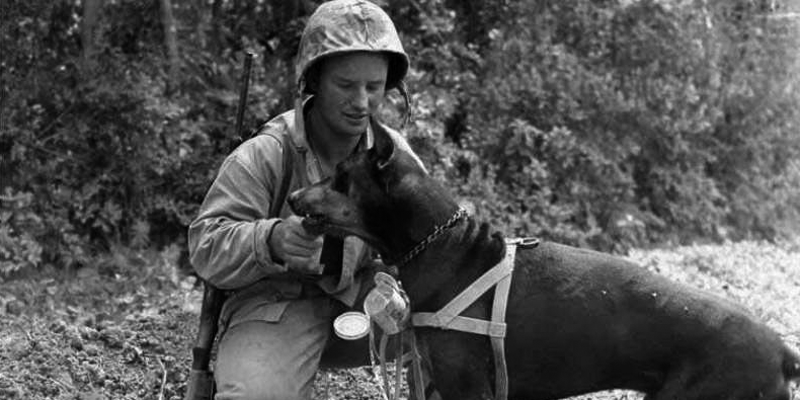 Learn more about the historical context of Soldier Dog.